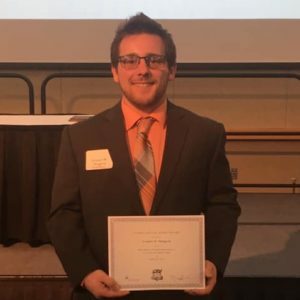 Conner Sturgeon is currently a Junior pursuing a Bachelors of Social Work, with a minor in Psychology, at the University of Southern Indiana (USI). He is currently the External Vice President of Lambda Chi Alpha fraternity and is in charge of their community image, philanthropies, and community service. Conner serves as Senior Resident Assistant of O’Daniel South Community and is a member of Student Ambassadors, as well as, Archibald Eagle, USI’s official mascot. Conner is a proud member of TRIO Student Support Services and through the program is a Peer Mentor.